Yesterday was a great day for Spatial Interoperability analysts. 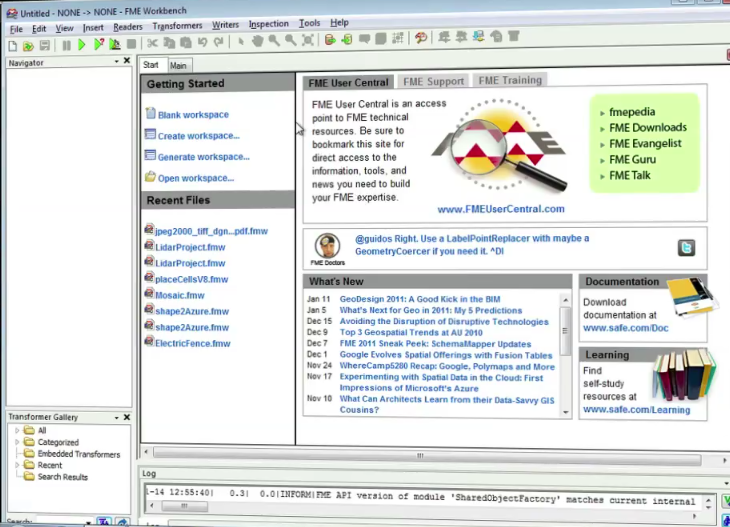 The day was marked with launch of FME 2011 with great feature additions over earlier versions. 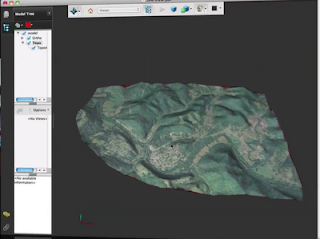 Support to process LiDAR data has been an important addition. Other notable additions include ability to read and write data into cloud, support for ArcGIS 10, AutoDesk FDO 2011 formats, addition of scheduling tool to the server version and more powerful XML support. Keeping up with Safe's tradition of valuing user feedback/suggestions, many additions are a result of user requests. In the official blog post by Dale Lutz, he notes that addition of features enabling the ability to work with LiDAR and point cloud data, convenient SQL querying, more powerful XML support, support for cloud storage options are all the results of user feedback received during various user meetings. Luckily, I had the privilege in the form of an email from Safe Software which offered me an inside scoop on what to expect from the release a few hours before the official launch. I must say, I am really impressed by the ease and the efficiency in which the new FME 2011 handles LiDAR data. Watching the demo by Dale Lutz made me feel so. In the demo, Dale works on a set of LiDAR files, an orthophoto, a topographic map and a DGN file to define the area of the project. The objective is to obtain an USGS DEM out of it and also a 3D PDF for the customers. Procedure involves inserting the reader features, transformers and writer features. New transformers PointCloudCombiner and PointCloudSplitter are added. This is followed by addition of other transformers like Clipper, SurfaceModeler etc. Finally writers are added to obtain the output in the form of USGS DEM, 3D PDF. To process all the six million points in question it is said to take just six minutes. Finally, really nice output was obtained in the form of a 3D PDF. 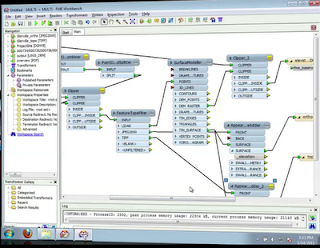 This appears to the best ever FME released so far and will definitely take data interoperability to new heights. To know more about FME 2011, check out the launch page (which also includes details on downloading FME Desktop and Server 2011). 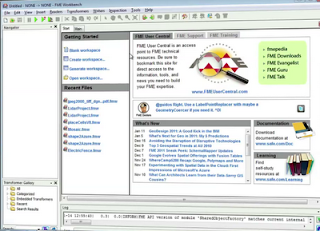 Also an upcoming webinar - FME 2011 webinar on Feb 8 will be explaining what's great in FME 2011. 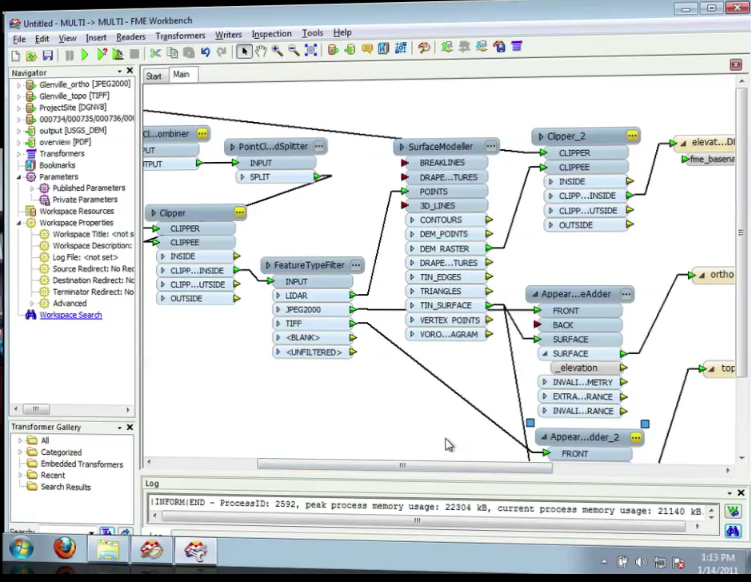 Also the FME Desktop 2011 tutorial is available in the form of a movie/playlist with 5 videos (total length: 49 minutes) on YouTube.